Freelancing can be a tough job. You are your own boss, which is great, but at the same time, you have to deal with all aspects of running a business. No matter what type of freelancer you are, you need to market your work, keep clients happy, network, do your administration, do your taxes and keep up with all the latest developments in your branch, and just is just a small selection of all the skills you need as a freelancer. But bottom line you just need to run a business, your own business, and that can be a hard job. So how do you learn about or keep up with all those skills and developments? Books offer a great way of learning and at a much lower price than taking, for example, a specialist course. By reading a book, you consume a huge amount of research in a relatively short amount of time, and it is one of the best ways to improve your skills. Now we know what we should be doing, right? Just start reading Freelancing Books! However, now there is another problem because there are a lot of books written about freelancing in the market, and there are much more to come. For instance, just doing a search for “Freelance” books in Amazon results in more than 3,928 books about Freelancing, so how do you make up your mind about what to read? You can do a google search and search for the Best Books about Freelancing, but then you get hundreds of “Best of Lists” in front of you, so that doesn’t help a lot either unless you want to spend a full day going through all those lists. Well, that is exactly what we did! We searched for 50 “Best of Lists” highlighting the most recommendable books for freelancers, selected and combined the 20 most valuable “Best of Lists” and earmarked and ranked what books for freelancers keep up appearing on most of those recently published lists. From a total of 143 books compared, reviewed and ranked, here are the Top 20 of Most Recommended Freelancing Books! As we are a small business ourselves, we use this list as well for educating and inspiring our minds and for optimizing our Consultants 500 platform. And in case you didn’t know yet, on our platform you can search for many types of freelancers all over the world. Finally, if you are a freelancer, you can always register for free if you want to, it’s all up to you. See here how it works. These books are not only about freelancing but also about how to run a business and what key aspects come into play, which in the end should help you with your freelancing business. The 4-Hour Work Week, by Tim Ferriss – Listed 10 out of 17 times. The book illustrates the benefits of working online and advantages of outsourcing tasks at a little cost. The author explains how one can create a 4hour work week to generate a five-figure earnings through online jobs. This book also appears on many other favorites lists, like Best Business Books of All Times. Rework: Change the Way You Work Forever, by David Heinemeier Hansson and Jason Fried – Listed 7 out of 17 times, this is one of the best and most helpful books to anyone seeking success in the freelance business. It emphasizes that freelancers should focus on income earning tasks and getting exposure to new and inspiring ideas. What to Do When It’s Your Turn (And It’s Always Your Turn), by Seth Godin – Listed 3 out of 17 times. The book contains inspirational narrations, quotes, and photos of works that have already been done. It guides freelancers on paths to take in building their new career. Think and Grow Rich, by Napoleon Hill – Listed 3 out 17 times and this book is as a result of two-decade research on the philosophy of personal achievement. It is a motivational literature in all areas of life including financial success. The $100 Startup: Fire Your Boss, Do What You Love and Work Better to Live More, by Chris Guillebeau – Listed 3 out of 17 times. The author narrates stories of different people who have succeeded in business with a startup of 100 dollars. The book explains the reality of success from life situations making to inspire freelancers. The E-Myth Revisited, by Michael Gerber – Listed 4 out of 17 times. This book reveals the myths that most entrepreneurs have when starting up a business and how assumptions and commonplace advice can lead to business failure. The Freelancer’s Bible: Everything You Need to Know to Have the Career of Your Dreams– On Your Terms, by Sara Horowitz – Listed 4 out of 17 times. This is a true Freelancing Book and it’s a guide to new freelancers on the basics of starting a business as well as to existing ones on how to grow and expand. It is an all dimension guide on all details and challenges of a freelancer. Anything You Want: 40 Lessons for a New Kind of Entrepreneur, by Derek Sivers – Listed 3 out of 17 times and this book guides entrepreneurs using past experiences of successful businessmen and acts as a manifesto with insightful prospective to entrepreneurs on how to thrive in business. Ego Is the Enemy, by Ryan Holiday – Listed 3 out of 17 times. This book contains interesting stories of business leaders who were wrecked by ego. The author emphasizes on having an honest approach to your business and be open minded to prevent ego getting in the way of success. Getting Things Done: The Art of Stress-Free Productivity, by David Allen – Listed 3 out 17 times. The book provides coaching on management. The author explains that productivity is a result of being relaxed. He expounds on efficiency and emphasizes that we should work with clear minds to achieve success. The 7 Habits of Highly Effective People: Powerful Lessons in Personal Change, by Stephen R. Covey – Listed 4 out of 17 times and this book explains how success depends on our ability to ultimately change of how we think. Therefore, we should adopt habits that can deepen our understanding, develop a better relationship with others and eventually become stronger and better leaders. Stop Thinking as a Freelancer, by Liam Veitch – Listed 3 out of 17 times. Another Freelancing Book and the author advices the freelancers to take their business just like any other business and get exposure to online works. He urges the freelancers to start having an entrepreneurial mind so as to grow the freelancing business. How to Win Friends and Influence People, by Dale Carnegie – Listed 4 out of 17 times. The book’s key wisdom is derived from the lives of prominent people and explains how to apply contemporary psychology to associate with people without being so manipulative. Book Yourself Solid, by Michael Port – Listed 3 out of 17 times and this book gives information on how to create a better market for oneself in the online business. Using illustrations, it guides the readers step by step on ways to conduct self-promotion and use it as a success factor in the business. Creative Inc.: The Ultimate Guide to Running a Very Successful Freelance Business, by Meg Mateo Ilasco – Listed 4 out 17 times. This book provides insight on how to start and grow a business that you have a passion for and gives practical examples on how to get your brand known, how to earn and strike a balance between work and personal life. Outliers: The Story of Success, by Malcolm Gladwell – Listed 3 out of 17 times and this book illustrates why some people succeed while others fail. Using relevant examples of successful businessmen the author explains the reasons for failure of some people despite having the same ideologies. The Hard Thing about Hard Things, by Ben Horowitz – Listed 4 out of 17 times. This book discloses that most people are not honest about how to run a business and discusses challenges that a company comes across. The author elaborates on how to overcome them using his experience in the field. Non-Obvious: How To Think Different, Curate Ideas & Predict The Future, by Rohit Bhargava – Listed 2 out of 17 times and this book explains how a freelancer can market their business to have a yearly workflow. The book will help predict trends of online jobs and create a market niche. The Zen of Social Media Marketing, by Chris Brogan – Listed 2 out of 17 times. This book elaborates on how to take advantage of the social media in your business as a way of being competitive. The author encourages freelancers to take advantage of social media in order to save time which can be used for more valuable and profitable tasks. The Challenger Sale: Taking Control of the Customer Conversation, by Matthew Dixon & Brent Adamson – Listed 2 out of 17 times.This is our last book and it provides information on the sale process focusing on challenges of clients. It provides insight on how to relate positively to the clients in order to gain loyalty. Our Blog focuses on helping you to find the best sources on the web related to Entrepreneurship for small businesses. Think of blogs, books, tools, software, online courses, firm rankings, universities and much more, all related to Entrepreneurship. It also includes guest posts from our users or visitors about all sorts of business topics. Via our Community Forum, you can share knowledge by having Q&A conversations about typical business issues or best practices in relation to all sorts of topics, including sharing your favorite Freelancing Books. Here you can share your Freelancing Knowledge, rank answers by how valuable they are, or just read and follow any Freelancing topic you want, and get noticed when new contributions are made to discussions you follow. Via Knowledge Resources you can quickly find the best Freelancing Resources on the web as suggested by our users and visitors via comments made or via the above Q&A. Think of blogs, books, learning, online courses, cheat sheets, salary surveys, tools, industry reports and much more, all related to Freelancing. We prepare a base list of Freelancing Resources and then this list is continuously updated basis tips received from our users and visitors. Via our Entrepreneurship Briefing Room, the Top Resources on the web are followed and only the most shared content is shown in relation to Entrepreneurship, Technology, and Freelancing. You can filter all the content for the last 24 hours, 3 days, 1 week, 1 month, 3 months, etc so you can easily find and stay up to date with the latest developments. More than 75% of potential Clients who look for Freelancers start a Web Search to find the best Freelancer for the Job. Because the internet is by far the leading channel, it is critical that your business can be easily found on the internet. Creating a profile on our Platform is free and opens the door to new opportunities, it can be done in only a few minutes and without any credit card. Easily find and compare highly qualified Professional Service Providers with all sorts of backgrounds by searching our Platform, which can be Firms, Advisors or Freelance Experts. Directly contact and work with your ideal candidate in any way you like. Searching is always free, and that also means that we never charge any transaction type of fees. We made a list of 50 posts that we recently published about “Best Freelancing Books” or “Best Books for Freelancers” to read. From this list of 50 posts, we selected the top 17 that seem most valuable to our readers and users. We combined the 17 lists of “Best Freelancing Books” and earmarked all individual books that were on those lists. All lists were summed up, and the Freelancing Book with the lowest number was ranked 1, 2, 3, etc. 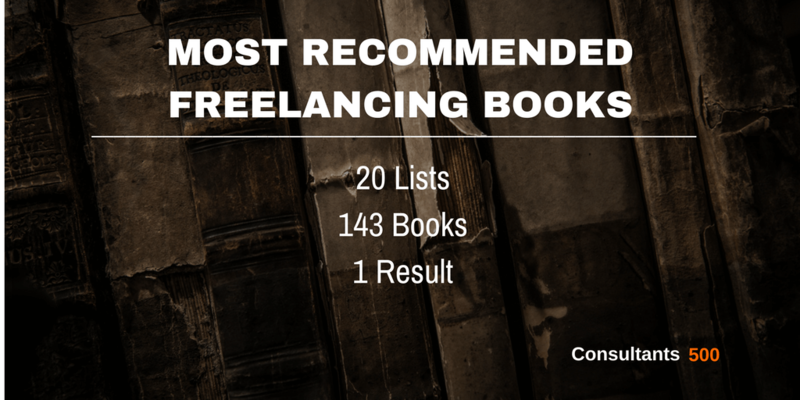 This resulted in the final “The 20 Most Recommended Freelancing Books” that have been read by many small business owners and/or freelancing experts. What are the best books on freelancing?